You may have heard that FOX used the Canon 5D MKII to film an episode of “House”. Now NBC is using a 7D for an upcoming Christmas episode of “Community”. If you’ve never seen Community, you don’t know what you’re missing. It’s got great writing and an excellent ensemble of stars including Chevy Chase, Alison Brie (from Mad Men), comedian Donald Glover and Joe McHale (from The Soup on E!). On Thursday, Dec. 9th, they’re going old school and doing a Rudolph-esq claymation episode. I don’t know why it never occured to me, but that kind of stop motion animation must use still cameras. Well, check out these two behind-the-scenes videos and you’ll see a Canon DSLR and lens being used. They’re using a Canon 7D with an EF-S lens that kind of looks like my 17-55mm. My first clue was at the :46 mark where you can clearly see it’s a Canon lens. At 2:35 you can clearly see the 7D emblem. I thought it was interesting at 2:08 that the viewfinder is taped off; probably to block extraneous light from hitting the sensor. Here’s another video shot by a couple of the cast members where you can get a better look at the camera and lens. I think it’s interesting that HD video capabilities are making DSLRs more common place in Hollywood; but here it’s being used for still photography. UPDATE: The YouTube videos are no longer available. But I did find this video on the NBC Community site. If you’re still looking for gift ideas for photographers, check out this retro camera-looking Iphone/ITouch case from Etsy artist, Coolbeans 717. It’s 20-bucks plus shipping and the site says there’s only one available. But they are handmade (takes 5 days to make!) So I imagine the artist can make more. In other news, I wrote about this next item on the PetaPixel blog. It’s a concept design called the Underabove. As the name implies, it’s a camera with two lenses that takes a picture of what’s below the surface of the water and above and then stitches the images together. The design won a 2010 Red Dot award and works like a submarine, with a water filled ballast on the bottom and an air filled one on the top. It even has a timer for self-portraits and a flash. And now, proof that photography is elemental. I think they did a good job of grouping things together. I just wish they’d tell me the atomic weight! Lastly, if you have Lightroom 3 or Photoshop CS5, make sure to download new updates. The updates fix some bugs and include updates to camera profiles for the lens correction feature. I’ve blogged about it before. Maybe it’s the challenge of actually capturing the vibrant colors AND creating an image that will move people. If you clicked the previous link, you saw my attempt. The story behind that is here. I only ever seem to see a rainbow when I’m in a car and that time I just happened to have a camera with me. Usually, you have to stop what you’re doing and race to get your camera before the fleeting moment disappears. That’s what happened last week to Reg Garner when an awesome rainbow appeared over downtown Orlando. I was at my desk in downtown Orlando when the receptionist called and said “you must to come up front right now”. When I asked why, she said, “you HAVE to see this rainbow and take a picture”. Well, I’ve seen a lot of rainbows and truthfully was not all that interested but to appease her decided to she what all the fuss was about. To my amazement, there was an incredible rainbow that seemed to span the whole city with both ends in full view. I scurried to get my camera gear as a cloud moved in and it to totally disappeared in front of my eyes. Disappointedly, I went back to my windowless office and about 10 minutes later another employee, that knows I take a lot of pictures, came to tell me that it was BACK! This time I had my camera ready and quickly had him drive me a few blocks away to get a better vantage point. I walked up and down Anderson Street in the rain trying to keep the rain drops off the lens. I knew from the first “click” that I had an amazing photo. I almost always have my camera with me and convinced that 80% of getting a good photo is just being there (with a camera). Like they say, always have a camera with you! Anyone traveling on I-4 at the time saw it and more than a few people took pictures from wherever they were. The Orlando Sentinel asked for submissions. Reg, a recent president of the Orlando Camera Club, posted his pictures of the rainbow on Facebook. I saw them and let him know the Sentinel was looking for submissions. I felt his images were far superior, not only because of the contrast and saturation…but it was the composition. If you look at the other images on the Sentinel gallery, most of them lack that “wow” factor. Sure they captured the rainbow, but it doesn’t leave a mark. It doesn’t tell a story. As I mentioned in a previous blog post, Scott Kelby’s advice to getting a really good rainbow is to shoot it in relation to something. In other words, compose it so that it’s not just about the rainbow, but the context of the surroundings. Reg could’ve taken the shot from the office window as someone else did, but instead, he hopped in a car to chase it down and frame it..compose it…you know, really make a picture. In case you think Reg is just lucky, one of his rainbow images is hanging in the Smithsonian Museum in Washington, D.C.
On a different note, if you’d like to add a little color to your photography, check out the limited edition Pentax-Kr. 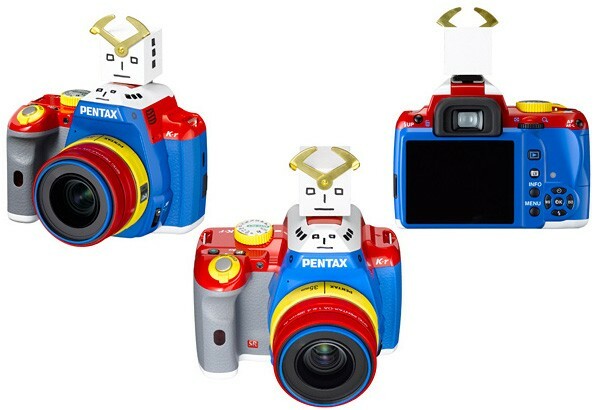 Pentax is making 100 of the cameras and selling them with a 35mm f/2.4 for about $1200 beginning December 24th. It won’t help you take better rainbow pictures, but it might add a little color to your photography! Canon Rebates, A Ton of Light and Amazing Images in Today’s Photography News Round-Up. If you’re still in the shopping spirit, Canon is offering rebates on the 7D, 60D and Rebel camera with certain lens combinations. You might remember a past blog post about different services photographers can use to check if their images are being used without permission. Well, now there’s an extension in Mozilla that lets you search various reverse image engines with just a couple of clicks of your mouse. You have got to check out this commercial by Vincent Laforet. He used 225,000 watts of light to shoot at 600 frames per second. Be sure to check out the behind the scenes video too. I wrote more about it on the PetaPixel blog. I’ve been following the story of New York Times photographer Joao Silva since he stepped on a landmine in Afghanistan. When the story first broke, reports said he kept shooting after the explosion. Now The Times has published the photos leading up to the explosion and the frames he shot just after. Amazing. I saw this last week, but didn’t want it to get lost in the Black Friday madness. National Geographic is holding its annual photo contest. You can see some of the submissions with captions from the photographers. If you liked that gallery then you might like Reuters Strange and Unusual pictures of the year. Lastly, I’ve mentioned The Still Image with Crash Taylor [WARNING: FIRST IMAGE NSFW] in a past blog post. I really like the images because the photographers describe the creative process including equipment, settings and post-process techniques. That’s it for today! Enjoy.